Hundreds are expected at a free dental clinic this weekend in Willimantic. The annual event is so popular that as of 11:10 a.m. on Saturday, the event had reached capacity for the day. Doors will reopen Sunday at 8 a.m. The event is first-come, first served and people often line up outside ahead of the start time. This year's event is at Windham Middle School at 123 Quarry Street in Willimantic. 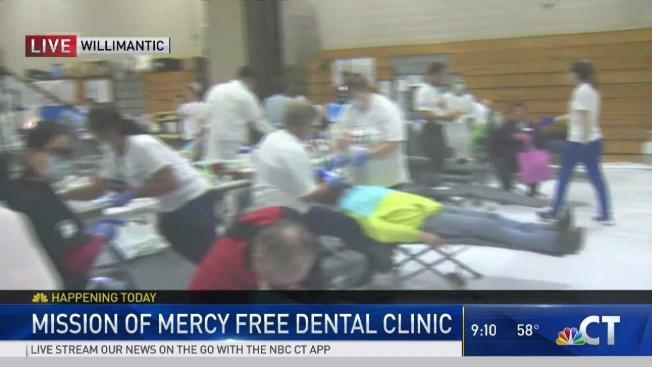 It's Connecticut Mission of Mercy's 13th dental clinic. “I got a couple things I want to get done today. Specifically wisdom teeth and maybe some cavities,” said Leo Olivera from Middletown. Amber Munsell from Vernon says she has a chipped tooth, and no dental insurance. “I probably need to get that filled, and I probably need to get some root canals, I’m not sure what else it’s been a couple years since I went to the dentist,” she said. For the Kumar family from East Hartford, it’s a full family affair. Sumit Kumar waited in line for hours with his wife and two kids. 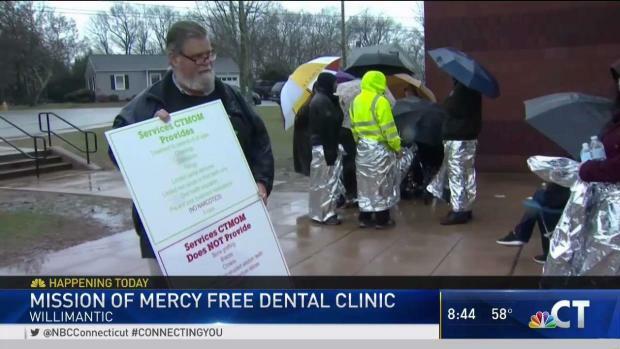 Dr. Jonathan Knapp, D.M.D., a board member of the Connecticut Mission of Mercy, says there is a great need in the state for dental care. “As one of the wealthier states in the country we still find that no matter where we go in the state we get people coming from all over the state. We have people that have come every year that we’ve done this,” said Dr. Knapp. Today, over 700 volunteers turned the Windham Middle School gym into a fully functioning dental hospital, with everything from x-ray machines, to an oral surgery unit. This is registered dental hygienist, Melissa Morra’s fifth year volunteering her services. “It’s very rewarding, it’s gratifying to be able to give back to people who otherwise couldn’t be able to get the type of care that we could provide them,” said Morra. She says the clientele today is different than her usual at the North Branford Dental Group. One of those veterans, is Gino Albertario from Southbury. “I’ve been coming for the last six years. And they’ve done everything for me,” said Gino. Today, Gino is getting two teeth replaced. Gino has a message for the dentists and other volunteers working at the Mercy Dental Clinic free of charge. Last year's event served 708 patients, including 72 veterans, with the help of 828 volunteers.